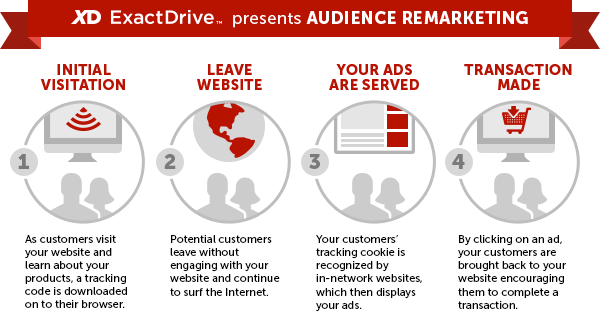 Extend your reach by leveraging Facebook Advertising capabilities through ExactDrive's Self-Serve Advertising Platform. Leverage the worlds largest social media platform by advertising on the prestigious Facebook.com domain. Target category sections such as Albums, Events, Pages, Home, Proﬁle, Photos and more. Check out the facebook advertising guidelines to learn more. ExactDrive’s retargeting component extends into the Facebook Exchange; Ads will be served to past visitors or lost prospects on the Facebook Newsfeed and Right-Hand side of Facebook encouraging them to complete the lead submission process. The Facebook retargeting efforts will leverage our real-time bidding (RTB) capabilities, allowing us to leverage the world’s largest social media platform and prestigious Facebook.com domain at the lowest possible cost. We can serve ads with personalized messages that encourage users to convert, like a Facebook page and/or share information about your products and services. Visit our dynamic ads page to learn more. View Facebook Inforgraphic. 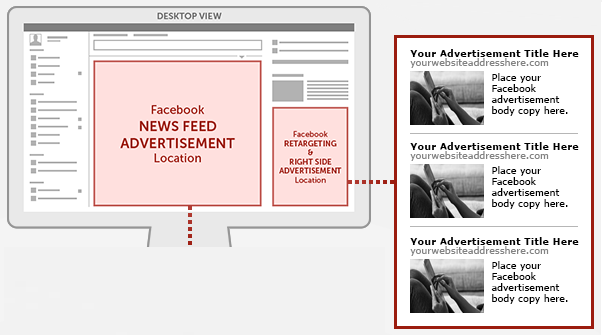 What Is A Facebook Right-Hand Side Ad? 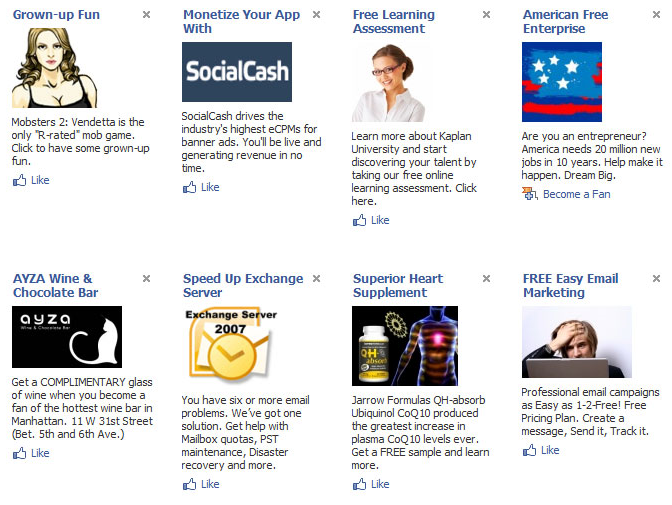 Facebook Right-Hand Side ads show up in the right-hand sidebar of various types of Facebook pages. A Facebook creative consists of an image, a title that displays above the image, and a body text that displays below or to one side of the image. When you add a Facebook creative to ExactDrive's online advertising platform, you also set the landing page where users will be sent after clicking the ad, select the brand associated with the ad, and enter a few other details. For detailed technical specifications regarding Facebook right-hand side ads please see Facebook's Creative spec and Creative policies. How To Advertise In The Facebook News Feed? 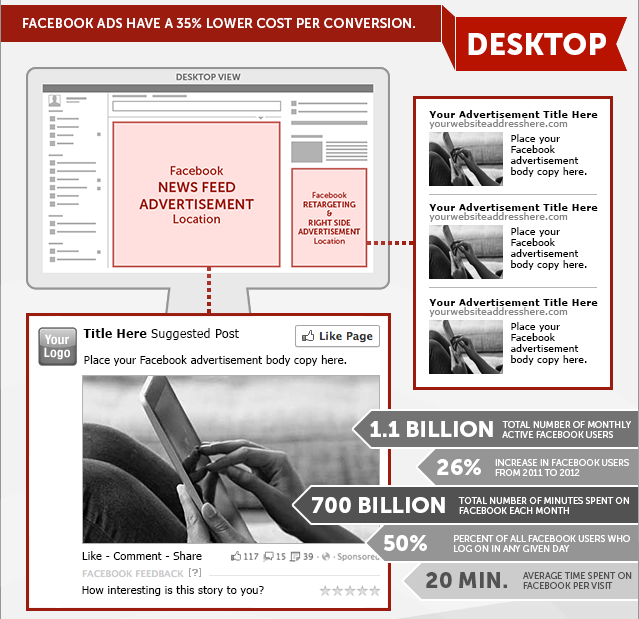 The Facebook News Feed is one of the most sought after locations to advertise on the Internet. With leading engagement and click-through performance the Facebook News Feed offers a fantastic opportunity to reach potential customers. Keep in mind that News Feed creatives typically have a more prominent placement than Right-Hand Side creatives. Also, the News Feed creative format, which includes social elements, has been shown to increase user engagement. With that said, Facebook does not currently offer any mobile app inventory for News Feed creatives. However, if a user views the News Feed within a browser on a mobile device, News Feed ads will be displayed. Research suggests that of the 3.010 billion active internet users that are online today, 2.078 billion utilize social media accounts. Numbers like these confirm that social media is becoming an incredibly important and lucrative part of the online advertising sphere. However, despite the fact that Facebook could be the most versatile social networking platform available for promoting your business to your target audience - few businesses fully understand how to master the Facebook ad engine. ExactDrive would like to help. Facebook delivers a number of fantastic opportunities for reaching your target market. However, your success as a company hinges on understanding the secrets associated with unlocking the website's true potential. Here are four of the top secrets that you should know if you're looking to unleash the power of Facebook advertising. 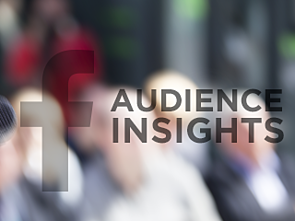 The "Audience Insights" aspect of Facebook advertising offers businesses the ideal opportunity to learn more about the potential customers on their email list. Though many people have heard of "Custom Insights", the Audience Insight option is one of the most important, yet under-utilized secrets of the Facebook advertising engine. This tool differs from the "Page insights" concept, as it allows you to analyze the latest trends that relate to your current and potential customers. Page Likes: the amount of comments and likes people have left on your Facebook posts, along with how often they have clicked on ads. Facebook Usage: whether your primary audience accesses your Facebook page through mobile devices or desktops. Buyer activity: information on the past buying behavior of current and potential customers, as well as the preferred shopping methods. With this feature, you can get your hands on some crucial information which should help you to implement better user-engagement policies on your business page. For example, if you discover that the majority of your audience visits your page from a mobile device, then you could consider making a mobile app for your webpage, or delivering creatives specifically tailored to a mobile format. Facebook has recently introduced a new advertising feature to help brands and companies retarget their existing or potential customers. If you've heard of retargeting or remarketing lately, you'll know that it's a fantastic and effective way of re-connecting with people who have previously shown interest in your brand or company. 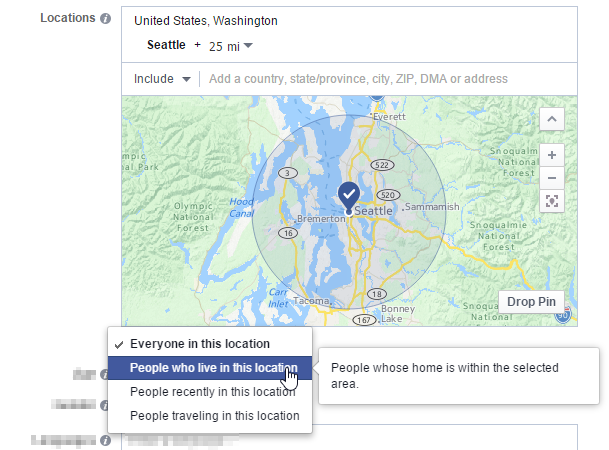 The Facebook "Custom Audience" feature allows you to keep track of people who have visited your website through a Facebook advertisement. The tool is useful in ensuring that you target your advertisements towards audiences who you already hold some form of relationship with. In other words, it assists you in directing your marketing efforts towards the users and visitors who are more likely to generate conversions. Fantastic for tailoring your marketing efforts according to the stage of the purchasing funnel your target customer is in, the Power Editor is an advertisement creation and management tool for those who want complete, customizable control over their campaigns. Once you open the tool - all you need to do is select the advertisement section at the top of the page. As the data starts to populate, you will find that a new button "Generate Variations" appears, allowing Facebook to mix and match aspects and create diverse ad variations based on Ad placement and type. If you're hoping your target audiences will take certain actions when they see your Facebook campaigns, such as subscribing to something or making a purchase - the conversion tracking tool should let you know if your campaigns are effective or not. Conversion tracking will help you calculate the ROI of your Facebook advertisements, by giving you data on the actions people taken when presented with your personalized marketing efforts. One of the most important parts of any marketing campaign you attempt is tracking the results. The more attention you pay to the conversions, leads, and interest that you are generating, the more likely you are to improve your future success and create a more effective Facebook advertising scheme. Remember, it's keeping up to date with the latest trends and understanding how to make the most out of the tools that they offer that allows you - the marketing expert - to distinguish yourself from the masses of people dabbling in online advertising. If you've begun to recognize the value of social media advertising in your online campaign, then you should already know the benefits that Facebook has to offer as a platform for connecting and engaging with your target audience. Facebook is one of the most popular and effective solutions for online advertising, allowing you to bring highly targeted traffic towards your landing page or website. Most businesses today have their own Facebook page, and promote their business through the use of Facebook ads and posts. However, just because advertising through Facebook has become a commonplace occurrence in the online advertising landscape of today, doesn't mean that all advertisements are as good as each other. The truth is that there is a lot of planning and consideration involved in developing a truly effective Facebook ad, and if you don't have the right tips and skills at hand, then you could be losing out on a huge possibility to increase brand awareness, develop your market base, and achieve profits. So what differentiates a good Facebook ad from a bad one? Lets find out. First and foremost, a good advertisement should have a purpose - one that has been clearly defined and agreed upon before you shell out any money. For example, are you interested in promoting an upcoming event or product release date? Are you simply hoping to grow your fan base? The goal that you have established will determine the type of advertisement you use, and exactly what ad copy you'll be using to grab your audiences' attention. Similarly, if you have a pre-established goal in mind, you'll have something to measure later when you want to figure out whether your efforts have been successful or not. Sure, a good advertising scheme will reach out to your market on a mass scale, but it's important to remember that Facebook, and other social media platforms, are about building relationships between companies and customers. On Facebook, you can build an online community that represents your offline community, giving you an opportunity to target your local market in a way you never could have accomplished before. So you've established your target market and you know exactly who you're asking to click on your ad. The next step is figuring out what's going to happen when they click that mouse and end up on your website. Landing pages are a staple of online advertising, and they help to determine exactly what your visitors are going to do when they arrive on your website. Your landing page should be designed to continue moving your customer through the purchasing journey, improving your chances of conversion, and building their loyalty. 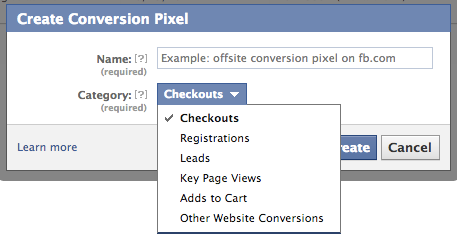 Do you know what's going to make your target audience click on your Facebook advertisement? Having a great landing page and a clearly defined market is a great start, but there are a few other factors to consider if you want to make sure that your potential customers don't simply ignore your ad. To make a Facebook ad engaging, you'll need to use marketing language to create an attractive body and a catchy headline, alongside a compelling photograph that makes people want to learn more. While Facebook can be an easy way to expand your online audience, you still need to apply essential marketing skills to make it work for you. Facebook is all about sharing information and forming connections. If you're worried that your ad may get lost in a crowd of statuses and uninterested customers, then you're going to need to take advantage of the current trends to make yourself more appealing. For example, post content that you know your audience enjoys. Generally, images tend to attract the most comments, likes, and shares, so don't be afraid to use an image that directly represents your company, brand, or selling point. When someone signs up to a social media network, they don't do so hoping to connect with businesses that are looking to sell them expensive products and services. Social media platforms are about human connections and developing relationships. Because of this, your social media strategy - from the statuses that you post to the advertisements you create, should be based on developing your personal brand voice, and showing the human side of your company. The more you convince your followers that you care about their needs, and want to offer value that they can benefit from, the more interested they'll be in whatever you have to offer. Keep in mind that, like most marketing strategies, you may need to test out a few different tactics before you find one that works well for you. Keep testing and developing until you discover a strategy that appeals best to your audience and generates the best overall results for your company.